A method of inquiry is capable of methods followed learners to realize what has been gained during learn. Inquiry put learners as subjects to active (Mulyasa, 2003: 234). Garcia (2003:2). Inquiry-based instruction is instruction using hands-on activities that allow children to explore scientific concepts, as well as instruction in which the focus is on using process skills to gain deeper understandings of the connections in science. Bruce and Davidson (1996:9) The Inquiry Model assumes that knowledge is constructed through meaningful activity which may include, but is not limited to, conventional literacy activities. Inquiry as a teaching method was invented by social studies teachers. Students were given data from different countries, and asked to analyze the data to make generalizations and predictions about the people of the countries. Inquiry is a term used broadly to refer to everything from pseudo-experiments where the teacher has the students reify already taught concepts to one in which students have virtually total control. The teacher tells the students what they will be learning about and tells them of the interesting implications of the lesson. In those activities where there will be a hypothesis, the students should always be expected to make their own hypotheses. This should be done in small groups (pairs), then in whole class discussion. Students should state their hypotheses in terms of the effect of one variable on another, and you must encourage them to justify their hypotheses. Once students have a clear idea of the purpose of the experiment or study, they should have some idea of how to find the answer. Often, the discussion of different hypotheses will give those ideas for how to test their own hypothesis. Just because they have shown that their hypothesis might be true does not mean they have proved it! The alternative might still be a possibility. They have to rule on the other hypothesis as well as showing that their hypothesis works. Once students know what they plan to do, they can make a list of the materials they will need. Sometimes it helps to tell them what materials are available before they design their procedure (one small way you can retain control) However, often the materials they need can be brought from home. If students are testing different kinds of food for starch and fat, you would encourage them to bring some from home. Before students begin the experiment, remind them of all safety precautions. If they are working with chemicals, they should be wearing safety glasses. If they are working with Bunsen burners, they should have their hair tied back. Etc. Then they are to carry out their experiment. Since they designed the procedure, they should know what data to collect. They should have a plan to record their data. Students should know what they are trying to find. They might need assistance in steering away from their affirmation bias, however. The students need to be reminded that they should start with more than one of each bean plant, just in case one of them is a dud. And, it might turn out that vinegar is good for germination of bean seeds. When your students have finished their study or experiment, they must discuss their results with one another. They must find out who had the same results, which had different results, why the results might have been different. They must interpret the results according to their original question. What do the results mean? The results will almost certainly lead to another question, and the process begins again. 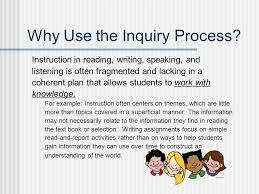 Alberta (2004:11) Inquiry-based learning is a process where students are involved in their learning, formulate questions, investigate widely and then build new understandings, meanings and knowledge. That knowledge is new to the students and may be used to answer a question, to develop a solution or to support a position or point of view. The knowledge is usually presented to others and may result in some sort of action. d) Shope their search for solutions, now and in the future. Belum ada tanggapan untuk "Inquiry Method in Reading"